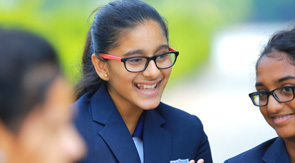 Manchester International School students are made acquainted to all activities in a graded manner. Apart from the above we have special programs to cater to language development and enhance knowledge in the field of science and technology. We believe that to truly grasp a language it is important to have daily reinforcement at differentiated levels. Daily language lessons begin at the Nursery level by learning songs and playing games to help familiarize these young students with a new language and its sounds. As students grow, the program becomes more intensive allowing each student to be challenged at an appropriate level so they can continue to progress. All aspects of a language are taught including listening, speaking, reading, writing (LSRW). DLL is a Language Learning Software that provides all the features required by students for language learning such as pronunciation practice, video presentation, audio broadcasting, quiz and exercise. The content for DLL is highly flexible. With DLL, language learning becomes easy, flexible and interactive. The focus of MIS library is to support the curriculum, to promote wide-ranging literacy skills and to develop in students a love of literature. It is important for students to develop a strong foundation of traditional literacy, as well as to layer on that foundation the emerging skills especially those powered by technological advancements. Our students learn to harness the power of technology and successfully integrate the use of a variety of tools and skills to enhance the breadth and depth of their understanding. MIS is home to a catalog of library resources including, e-books, periodicals, magazines and newspapers. We widen the horizons of our students by catering to their learning needs through advanced digital library with E-books and E-journals. Every child is inspired and encouraged to go to the library during library periods as well as in free time. Apart from encyclopedias and reference books on all subjects, the content-rich library at Manchester International School has comics, story books and illustrated dictionaries as well, for the overall development of the young mind. A novel concept – class room library is also introduced in the junior classes. We are driven by the motto to strive hard with commitment and dedication, which requires team spirit and tenacity to serve the strategic information requirements of the academic community on a continual basis pin-pointedly, exhaustively and expeditiously. MIS has developed a comprehensive program to inspire young people and develop an early interest in Robotics engineering, 3D Printing, Fashion Design and Photography. This new program is part of our schools’ bold goal to engage students in science and technology. This program is delivered through clubs, school enrichment classes, and after-school programs. Robotics is the branch of technology that deals with the design, construction, operation, and application of robots, as well as computer systems for their control, sensory feedback, and information processing. These technologies deal with automated machines that can take the place of humans in dangerous environments or manufacturing processes, or resemble humans in appearance, behavior, and/or cognition. Many of today's robots are inspired by nature contributing to the field of bio-inspired robotics. Fashion design is the art of application of design and aesthetics or natural beauty to clothing and accessories. Fashion design is influenced by cultural and social attitudes, and has varied over time and place. Fashion designers work in a number of ways in designing clothing and accessories such as bracelets and necklace. "Designers conduct research on fashion trends and interpret them for their audience". They attempt to design clothes which are functional as well as aesthetically pleasing. Photography and videography refers to the process of capturing and moving images on electronic media and and even streaming media. The term includes methods of video production and post production. The word combines “Video” meaning “I see or I apprehend”, with terminal ending “Graphy” meaning to write. Its contemporary sense it video writing or video recording.